CARY, NC (September 8, 2017). Most seniors prefer to age in place, remaining in their current homes and communities. Family members want that for their loved ones as well, but often struggle to ensure the care and resources necessary for their safety and well-being. 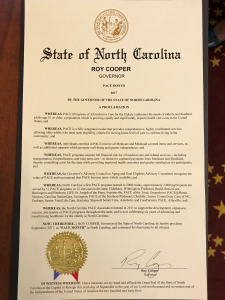 As Governor Roy Cooper related Wednesday to members of the NC PACE (Programs of All Inclusive Care for the Elderly) Association, he was fortunate to have those resources as he and his brother cared for their parents, but he wondered how other families might cope. 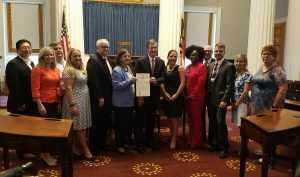 He recognized PACE for providing those services that help seniors remain in their home as long as possible, by proclaiming September as PACE MONTH in North Carolina. PACE is a comprehensive, person-centered fully-integrated model of care delivered and coordinated by an interdisciplinary team of medical professionals, social workers and direct care staff. Each participant has an individual plan of care that takes into consideration their unique medical, dietary, behavioral, and other social determinants of health. Transportation, medication, physical therapy, socialization and all medically necessary services are provided at no additional cost. “PACE is a unique model of care that looks at the whole person and how best to support that person to have better health, quality of life and satisfaction. It also works hand in hand with their caregivers, decreasing burnout and allowing them to continue working while having the peace of mind that their loved ones are receiving the care that they need,” said Linda Shaw, Executive Director of NC PACE Association. North Carolina’s first PACE program opened in 2008. Today, there are 11 programs with 12 centers serving over 2,000 participants. Since inception, PACE in North Carolina has served approximately 3,650 participants, along with their family members and other caregivers. Nationally there are 239 PACE centers serving over 40,000 PACE enrollees in 31 states. Every senior enrolled in PACE meets the requirements for nursing home care, yet 95% of PACE enrollees live in the community. North Carolina PACE programs are celebrating with a variety of events and activities throughout the month of September. A calendar of events is available online. North Carolina PACE Association serves as the credible voice and leader to advance PACE (Programs of All Inclusive Care for the Elderly), thereby transforming healthcare in North Carolina. Our mission is to support the development, expansion, success and quality of PACE programs across the state, so that every person who is eligible for PACE will have access to this service. For more information, visit www.ncpace.org.